Online CrossCribb Beta Version is Live! Happy to let everyone know that you can now play CrossCribb online against anyone you would like. Got a friend in another country? No problem. Just fire up your web browser and head over to http://www.ecribbage.com and start a game! The beta version of CrossCribb Online is available for two player games. However a computer opponent will be available soon as well as a 4 player version. 6)This is a Java based game – so you will need to load the Java program on your computer. This may take a little time to download, but once you’ve got it the game plays very fast. 7)Wait for the game to load and then enter a lounge. 8)Within the lounge view the menu at top and select the game category in the left corner of screen. From there select “Start New Game” and then select CrossCribb. Currently the beta version only supports 2 player games. So once you’ve selected the play options you will need to wait for about a minute to have someone join the game you’ve created. Have fun and please let us know what you think! 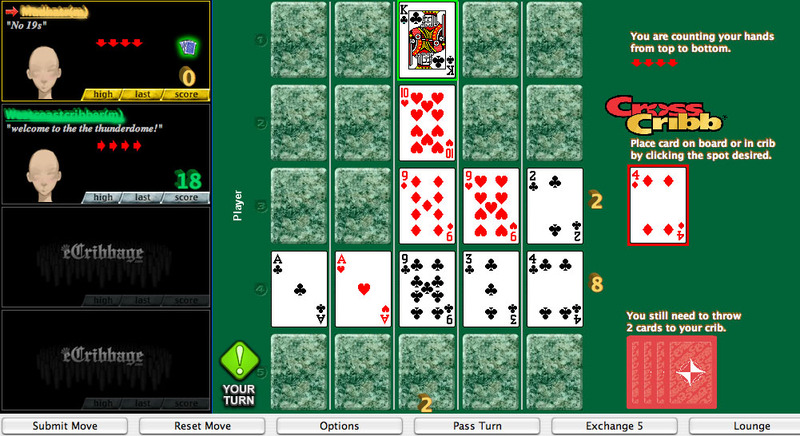 This entry was posted on July 7, 2010 at 11:56 pm and is filed under CrossCribb, Online Cribbage. You can follow any responses to this entry through the RSS 2.0 feed. You can leave a response, or trackback from your own site. Having just learned how to play cribbage, I had to google what the difference was between that and cross cribb. I had trouble with the game when it was only two players so I’m a little worried it might be more frustrating with five or six. It seems more fast paced and has the possibility of being that much more fun, though. Maybe I’ll give it a shot. Familiar story that I’ve heard from numerous people after their first attempt to play cribbage. The most difficult part of cribbage is learning how to score and count hands. Once you have that down you will be able to enjoy cribbage and CrossCribb alike. CrossCribb is a game that is based off the cribbage scoring method. The nice thing about CrossCribb is that all hands are played open faced on the playing board. This is helpful when learning the game as an experienced opponent can help explain each move the both of you make while you are playing. If your serious about attempting to learn cribbage or CrossCribb you may want to visit http://www.ecribbage.com where they have a great community of avid cribbage players online. Here you can practice against a computer opponent or play someone live over the Internet while having a chat with your opponent about strategy, etc. If you would like me to teach you how to play CrossCribb I’d be happy to do so online. Just let me know.